Constructed without a solid tree in order to make fitting a breeze, these saddles offer a close contact ride and the ability to fit multiple horses. These are a great option for the hard to fit horse. This beautiful treeless saddle is great for hard to fit horses! The saddle features rings and ties for accessories and makes it a great choice for all of your trail saddle needs! 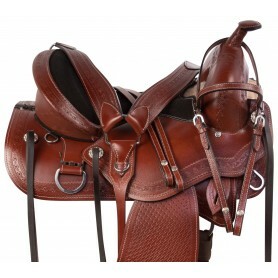 It comes complete with a matching tack set for only $399.99 today!